It's hard to fault a lot of young people for are asking the question of "Who is U2? ", because after listening to Songs of Innocence, this is a question that not even the band themselves could answer. There are a lot of questions that have surrounded U2 since the highly-publicized surprise release of their 13th full-length, Songs of Innocence: how will this effect future album releases and promotion? Despite being available in over a half-billion iTunes account, what does it mean when it was actually downloaded only 200,000 times in the U.S.? Which record label actually put out the album (Rolling Stone lists Universal Music Group, iTunes lists Island, the New York Times lists Interscope, and the band's own website fails to list a record label at all)? Why isn't their halfway-decent charity track "Invisible" included? And, for some younger people, the biggest and most important question actually proved to be indicative of the response to the album overall: who is U2 anyways? By associating themselves with a massive media stunt of this nature, the band can't be too surprised that a great majority of the reviews that have come out since the album's release have talked about the album in much larger "future of the industry" standards, most publications rushing out reviews—which, in some cases, doubled as thinkpieces—as a way to garner traffic instead of actually giving the music any real consideration (these rapid-fire critiques proving to be something that U2's own website was more than happy to round up). Yet most publications are speaking to a very specific subset of readers who are already familiar with standard pop music history, as a lot of young people don't know who the band is for good reason: they have been out of the spotlight for a very long time. And worse, it's been even longer since they put out anything that could be considered even marginally culturally relevant. Don't forget: the group's last album, 2009's No Line on the Horizon, was massively hyped, but while a majority of print publications tripped over themselves to lavish praise upon it (something that Rolling Stone still continues to do like clockwork), online publications were unafraid to question its merits, lead single "Get On Your Boots" proving to be one of the most bone-headed things the band had ever been associated with. Since then, Bono and The Edge wrote the heavily-derided music for the spectacular Broadway failure Spider-Man: Turn Off the Dark and only emerged occasionally to provide news about the progress of their new album (that Danger Mouse was working on it, that Adele's producer Paul Epworth and OneRepublic's songwriting kingpin Ryan Tedder were brought in a bit later in the game, clarifying that Epworth and Tedder weren't replacing Danger Mouse, etc). But when Horizon proved to be the band's lowest-selling effort since 1997's Pop, it was obvious that some course-correction was needed in order for them to stay even remotely germane, which, if Bono's self-penned hagiography is to be believed, is something that U2 is perpetually striving for. Thus, when the wordless group vocals of "The Miracle (of Joey Ramone)" open up the album, the intent of Songs of Innocence is immediately clear: a gamut of trend-chasing histrionics will be haphazardly adapted to fit in the framework of a U2 album, followed by lots of money being printed somewhere. "We got language so we can't communicate," Bono tells us on the single, "Religion so I can love and hate / Music so I can exaggerate my pain / And give it a name." Exaggerate is definitely the right term, because on an emotional level, this is, despite the thundering guitars and obvious pop bombast, the coldest album U2 has made since, you guessed it, Pop. As the album progresses, the band adopt a lot of different poses, often imitating the style of other acts instead of pushing their own sound into the fore. Even during the dance experiments of Zooropa and Pop and their "return to rock" with How to Dismantle an Atomic Bomb, the band has always been able to fuse their identity onto new trends, which, even with its notable flaws, they were still able to do (somewhat) with No Line on the Horizon. Here, though, there is no linearity or consistency to be found, staking out Echo & the Bunnymen-styled atmospheres on "Every Breaking Wave" and "California (There is No End to Love)" and then staging Black Keys-styled garage-guitar grooves on the verses to "Cedarwood Road". While there's nothing inherently wrong with U2 trying out a variety of different aural costumes over the course of an album (it worked spectacularly with Achtung Baby), these individual moments feel completely separated from each other. Each song has the feel of an insular experiment that feels completely disconnected from what comes both before and after it. "Iris (Hold Me Close)" is perhaps the best example of Innocence's problems. Although a heartfelt tribute to Bono's deceased mother, the typically Edge-y guitar echoes seem themselves unsure if this is meant to be a mid-tempo ballad or out-and-out anthem, Bono's lyrics veering wildly between emotionally potent ("The ache / In my heart / Is so much a part of who I am") and overtly e-card sentimental ("Something in your eyes / Took a thousand years to get here"). The detailed 1974 car bombing tale "Raised By Wolves", meanwhile, feels positively rushed by its own 4:05 runtime, its stark use of silence following the Edge's guitar stabs—coupled with the breathy looped vocals—never achieve the kind of abrasiveness or dramatic weight that would allow this story to land on an emotional level. For a band who practically reinvented the way melodrama could be used to achieve pop catharsis in the late '80s (see: "Sunday Bloody Sunday"), it's downright stunning to hear the band rush their own moments, failing to give a majority of these songs time to breathe. Yet the biggest pain point for Songs of Innocence is how despite the inclusion of forgettable fare like the closing Lykke Li duet "The Troubles", there are some truly great moments to be found here. While "Every Breaking Wave" is perhaps the album's most successful pop moment (and the punkish strut of "Volcano" almost makes you think the band has finally remembered how to have fun again, at least for the first time since All That You Can't Leave Behind), "Song for Someone", despite its painfully-bland lyrics, actually has the album's most outright affecting melody, the Edge's acoustic work helping give the song some real distinction in this sea of otherwise fuzzed-out guitar tones. Best of all, however, is the lo-fi synth pulse that makes gives "Sleep Like a Baby Tonight" its backbone, the song featuring a slightly-cacophonous vocal from Bono as well as some lyrics that prove to be more cryptic than nonsensical, actually pointing the group towards a sound that feels remarkably understated but refreshingly new, as if the more out-there experiments of Horizon have finally paid off in this stunning little number (bonus points also awarded for Bono pushing himself into strained, almost-comical falsetto during the bridge which completely works within the context of the song). Yet a few stunning moments do not a great album make, and repeated listens don't endear these songs in the way that David Fricke would lead you to believe. At times, if feels as if the band really is stretching out into new territory, daring themselves to try something new (or pointedly retro) in order to give themselves some new energy. 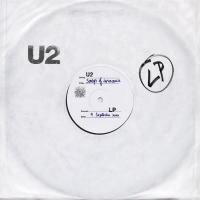 However, a majority of Songs of Innocence shows the band fumbling around with current chart trends, settling for melodies and lyrics that are simply "good enough," and generally making moves that reek of desperation instead of confidence, a stance that is very ill-fitting of U2, given that ego and a perpetual belief in their own hype has been a part of their DNA from the onset. So despite the band's best efforts, it's hard to fault a lot of young people for are asking the question of "Who is U2? ", because after listening to Songs of Innocence, this is a question that not even the band themselves could answer.